By Dr. Sam Spiegel, University of Edinburgh. 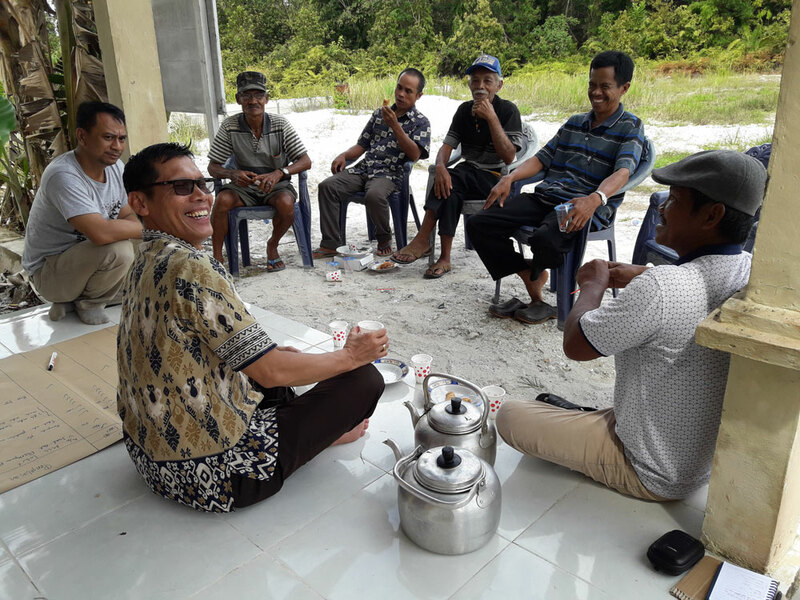 In this blog, Sam writes about his research for the CIRDI project Capacity-Building for Multi-Level Governance of ASM in Indonesia. Sam is working with the local NGO Yayasan Tambuhak Sinta to provide technical assistance to the Indonesian government to improve design and implementation of environmental policies for the artisanal small scale mining sector. In 2017 I partnered with Yayasan Tambuhak Sinta (YTS) on participatory research with the artisanal and small-scale gold mining (ASGM) community of Tewang Pajangan village, in the Gunung Mas district, Central Kalimantan. Our research built on several years of community collaboration and offered fresh opportunities to learn about local histories, values, priorities and challenges from the perspectives of artisanal miners, farmers, district government planners and others in the community. Gender mapping with groups of ASGM miners and farmers aimed to provide an analysis of the ASGM gender dimensions as well as provide a basis for gender-responsive actions. Ten women and ten men participated in the first phase of mapping which identified a range of views regarding living conditions, needs, gender division of labour, roles and responsibilities, participation, access and control of resources and public services, as well as decision making powers. Life-history interviews in the village explored accounts of local miners’ histories, how ASGM activities evolved over time and changed the community’s livelihoods and ways of life, and led to wider social and environmental transformations. We found that some of the major issues pertained to the economics surrounding difficult decisions. For example, artisanal and small-scale gold mining activities provide a much better income than working in the forest or rubber plantations. As the price of rubber and rattan dropped over the last few years, many villagers began mining in the forest and plantations. Although gold mining is a key livelihood, concerns were raised about the diminishing gold deposits and the uncertain future of ASGM. The analysis indicated that people in the community hope to have mining locations rehabilitated by the government, as well as to obtain vegetation aid, among other changes so as to be able to have a more sustainable alternative livelihood after the mineral resource is exhausted. Ten women and men from Tewang Pajangan village whose livelihoods spanned mining and farming were trained to use cameras for a research method called ‘photo-voice.’ Photo-voice is a visual story-telling technique that uses images of key places, landscapes and situations that explore the significance of various challenges faced by the community. The project resulted in an photo exhibition titled The Story of our Homeland. The process began with a workshop attended by 36 representatives from the village and several high-level district government policy and program makers. The event linked community interpretations with policy implications as part of a larger effort to transform how people think about challenges in mining areas. A representative from the Regional Planning, Research and Development Agency of Gunung Mas district closed the exhibition with words of encouragement, stressing his hope that photo-voice can produce an action plan to follow up discussion results for Tewang Pajangan and beyond. Photo-voice is a visual story-telling technique developed for the research, where people are trained to use a camera to take photos of key places, landscapes and situations that are meaningful to them. 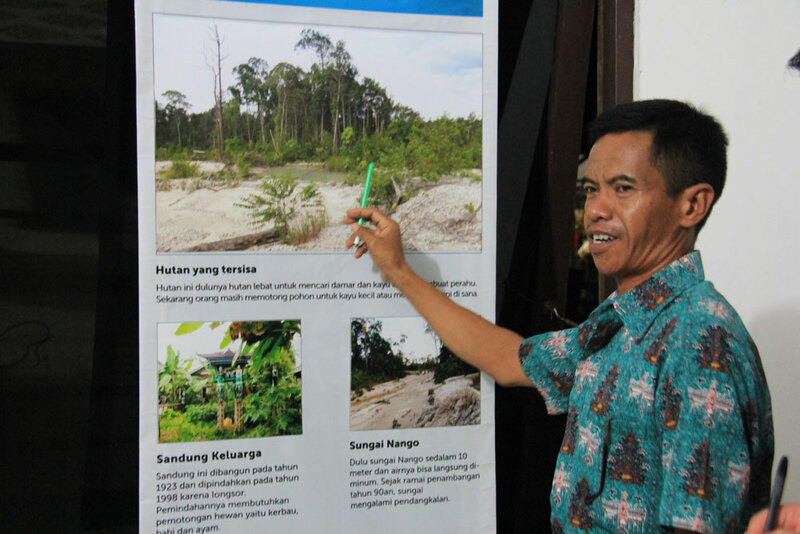 CIRDI-supported activities were carried out in February 2018 in Tewang Pajangan village, as the follow-up action from an analysis published in the academic journal Ecological Economics, and of a recommendation addressed during the photo-voice workshop and exhibition. CLAP is a process that is generally implemented by YTS as the initial stage of assistance to a community to review their current state of village planning, and explore the challenges as well as priorities to develop the Village Development Plan. Forty-two village government and community representatives attended the first Community-Led Analysis and Planning (CLAP) socialization event. It resulted in a plan with the local government and Tewang Pajangan villagers for YTS to provide CLAP training for key community members, followed by assistance to all Tewang Pajangan village communities. Community planning exercises were part of the participatory action research conducted by CIRDI in Tewang Pajangan village. These district-specific activities are also part of a wider effort to support participatory research that can feed into the policies and practices of various government institutions working in areas where mining is a significant driver of social, economic and environmental change. In addition to supporting village level planning in Central Kalimantan, CIRDI’s project in Indonesia has supported various other activities of engagement with policymakers with the goal of artisanal and small-scale gold mining-dependent communities to enhance environmental management and livelihoods across the country. For example, in December 2017, Bardolf Paul, the director of YTS, and I participated in a national dialogue on the Minamata Convention on Mercury in Jakarta. The event was co-sponsored by the United Nations Environment Program (UNEP) and national government ministries in Indonesia, including representation from mining, environment, health and other ministries. Bardolf Paul gave a presentation detailing experiences of YTS and its community engagement strategies to support technological changes to reduce mercury use and pollution in artisanal mining areas. New empirical and conceptual insight on mercury and ASGM in Indonesia was generated by an interdisciplinary team as part of a CIRDI-sponsored research project. The study drew on ten years of experience and highlights the need to revisit common assumptions about interventions designed to address challenges in mining communities, addressing both practice-oriented policy debate and academic debates on engaging “labour” relations in the field of ecological economics. Published in Ecological Economics, this research specifically explored experiences in gold mining regions in South Kalimantan, Central Kalimantan, Central Java, East Java and West Java. 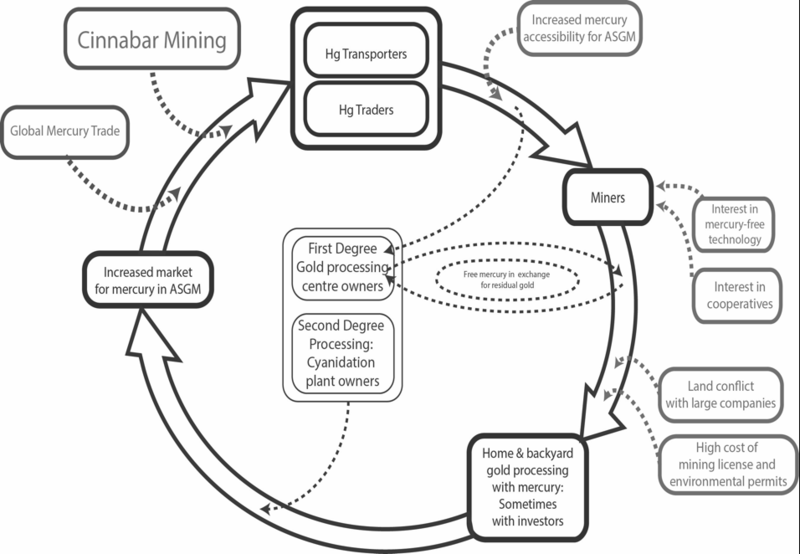 It also analyzed significant changes and new ways of thinking about mercury and ASGM in Indonesia’s mining communities after 2012 from Maluku and other areas where cinnabar extraction has created the development of new mercury supplies. It charts the inter-connectedness of mining frontiers across different parts of Indonesia along with power relations governing local labour practices and technology, making the case for new paradigms for engaging and being guided by local knowledge. Beyond re-conceptualizing the social dynamics surrounding the issue of mercury, the Capacity-Building for Multi-Level Governance of ASM in Indonesia project is addressing a much wider suite of applied research aims including issues of land use, attachment to place, local knowledge, multi-scale governance processes and the gendered dimensions of community life, labour and local histories in ASM communities. With a particular emphasis on contemporary experiences in three districts in Central Kalimantan, the project has also been supporting knowledge sharing and collaboration through engaging with academics, policymakers at multiple levels, non-governmental organizations and diverse social groups in mining areas more broadly.